After the presentations at the Covenant Christian Centre’s Singles Summit held recently, it was now time for questions and answers. A guy came up to the microphone and asked “Do Christians need pre-nups? “ Even though the question was presented to the three couples that made the presentations, I was nominated to answer. Impulsively, I blurted No way. Why should a Christian think of Pre-nups? The premise of a pre-nup is wrong. But before I go on, What is a pre-nup? According to the definition obtained from Wikipedia, A pre-nuptial agreement, antenuptial agreement, or premarital agreement, commonly abbreviated to pre-nup or pre-nupt, is a contract entered into prior to marriage, civil union or any other agreement prior to the main agreement by the people intending to marry or contract with each other. 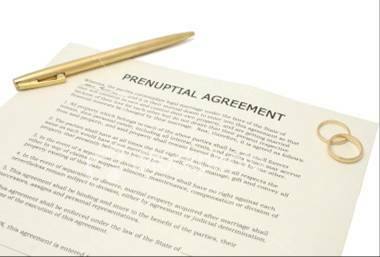 The content of a prenuptial agreement can vary widely, but commonly includes provisions for division of property and spousal support in the event of divorce or breakup of marriage. They may also include terms for the forfeiture of assets as a result of divorce on the grounds of adultery; further conditions of guardianship may be included as well. Though the pre-nup seems to have been created with good worldly intentions, the bedrock is totally wrong. The pre-nup undermines a couple’s marriage and may even increase the likelihood of divorce. Jesus had the following words to say when he was asked about divorce (Matthew 19:3-10). Clearly Jesus was and is still against divorce. When a couple thinks of a pre-nup, they have embraced divorce and opened the door for the Evil one to enter into the marriage. Unwittingly, unconsciously they have embraced the phrase - For better, for stay; For worse, for go. Why do secular people ask for pre-nups? Two basic reasons account for this – wealth protection and related party’s protection. Wealth Protection – When a partner brings a lot of wealth into a marriage and the other does not, those that are pro-prenups say a pre-nup helps to protect the one bringing the wealth. However my own point of view is that if the wealthy partner is thinking of his/her wealth before marriage, he does not trust his/her spouse and is not ready to embrace the oneness in marriage. Related Party’s Protection – A premarital agreement can protect the inheritance rights of children and grandchildren from a previous marriage. My view is that there are other legal ways of protecting the children without a pre-nuptial. I must reiterate that The Creator said that the Two shall become one flesh. So they are no longer two, but one flesh. A pre-nuptial opens the door for a way out. I will like to invite my unmarried readers to the Singles Summit where my wife and I will be speaking on the “Pre-requisites for a successful marriage”. The Singles' Summit is an initiative of Covenant Christian Centre. The aim of The Singles' Summit is to shed Biblical light on relationships and make clearer the path that God would have us tread as Christian singles living in the 21st century. The Interactive Forums Edition of the Singles Summit slated to hold on Saturday 19 February 2010 is aimed at creating an opportunity for every single to interact with individuals who have experienced what we all go through in our various relationships on a down-to-earth basis. It is a multiple-venue event which means that different topics are spread among different facilitators in the five (5) different venues. In order to be at the venue where your topic(s) of interest will be discussed, it is imperative to pre-register and get a seat reserved for you. However, you can only register to be at one venue only. So, if you want to register, just click this link!